It’s no surprise that at the end of the year, things get a bit colder, though like Christmas, the spring, the rentrée, and the new monthly Rihanna song, we greet these evergreen occurrences with ever-theatrical and amped up shock, bewilderment, and frustration. "Oh my word, it's so cold in Paris..." Tweets and Facebook status ensue. Fortunately, I like the cold. Never was there a better reason to stay inside in my PJs, and when I do venture out to go running, there’s no fear of heat exhaustion or sunburns. And who doesn't love snow when it makes the rare appearance? 1. Going to the market: In years past, I avoided the market in the winter, which meant I often suffered from scurvy-like symptoms and a lack of adequate nutrition. This boy needs his clementines. But browsing the merchandise, carrying kilos of produce, and lugging it back up five flights of stairs is not a pleasant task in freezing temperatures. But I found the perfect solution, finally. I throw on my thermals, grab ten years, and lace up my running shoes. With markets all over the city, I can easily run to a destination (say, the market at Bastille), load up on carrots and beets, and take the metro home with minimal discomfort. After a 10k run, a quick trip to the market seems like cake. 3. Texting: Once upon a time, texts were expensive and rarely unlimited. This is how I learned to text in the US – just a few each month, as if my phone would run out of electronic ink. In the winter, I wouldn't walk up Fifth Avenue having a text conversation. My Parisian phone service however allows me the liberty to text whoever I want in France, and What’s App and Viber make international texting easy as pie. The problem? Fingers get cold. Fast. Most outdoor texts that I send leave people believing that I am drunk due to the amount of spelling errors that I make while hurriedly typing to get my hands back in my gloves or pockets. 4. Drying clothes: In America, we have dryers. We like to expel as much carbon-producing energy as possible to make sure our undies and socks are dry as a bone, and who can forget the smell of fabric softener? In Paris, it’s a different story. If you have a dryer, I raise a glass to you. For the rest of us who have washers, while grateful, the process of drying clothes has become a seasonal puzzle that I’ve yet to solve entirely. In the spring and summer, open the windows and hang dry. Done. In the winter, it’s a delicate balance between turning the heat up yet opening the windows the let out the moisture, or letting the cold dry air work its magic over a few days while I shiver in bed. In the end, I end up finishing off Mother Nature’s failure with the hair dryer, expelling as much energy as a simple dryer might. 5. 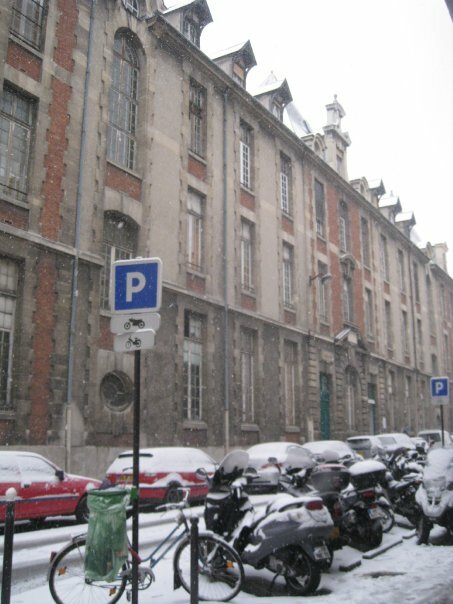 Taking the Vélib: Biking in the cold? It can happen, with the right amount of scarfs, gloves, and hats to protect you from the frosty wind that blows right through you. I never even thought about biking in the cold in the US, but here, I’m always tempted. I saw gloves designed for texting on a touchscreen the other day. I'm going to ask Santa for a pair. Oh, how I enjoy your fearless world there in Paris...when your posts pop up at Hip Paris, which I read, I marvel at them for their ability to make me laugh and your eternal optimism is very endearing. Today, reading about your lack of a dryer, I couldn't help but wonder if there wasn't a laundromat in your neighborhood; if so, why wouldn't a short trip there with damp clothes in a duffle, a cup of coffee, and, a book, make your suffering end? The thought of the cold wet socks, just did me in...keep me posted! Aw thanks :) Regarding a dryer, yes, there is one down the street, but it also doubles as a makeshift shelter for some shady characters during the cold days, plus lugging my laundry up and down 6 flights of stairs is never a desired task. But yes, I do it from time to time when I'm desperate...so far only once since last winter! re: #3, i own these in gray.. I developed a Treasure Hunt at the Natural Museum! That's Dr. Bryan, please. I wrote a book. I own a tour company. I've run 11 marathons. I'm American and French and that's all I know at this point. Bryan Pirolli -- That's me.. Powered by Blogger.